Twenty skippers arrived to a few light and tricky east-north-easterly breezy. Consistency over the day saw Brad Gibson take the win from a close group of John Tushingham in second, Martin Roberts in third, Rob Walsh in fourth and Darin Ballington in fifth. We would like to thank all skippers who travelled and took part in fine spirits in the challenging conditions. Thanks also to our race team Jack, Bernie, Victoria, Dave, Jim and Andrew. 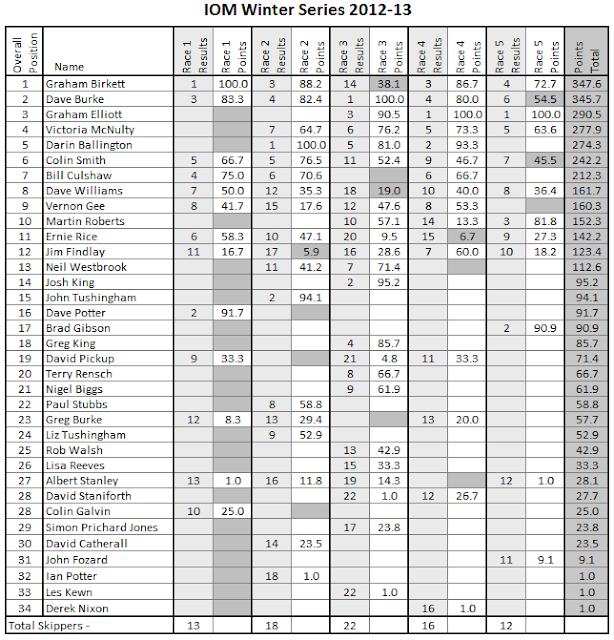 Saturday saw the final round of the club Marblehead Winter Series with Bill Culshaw not only taking the win on the day in light to fickle A suit conditions, but going on to win the overall event from Brad Gibson and Ernie Rice. This was the first year we have run a Marblehead Winter Series at the club and after attracting 10 entries, we look to an even bigger fleet throughout the year with a few regulars returning. 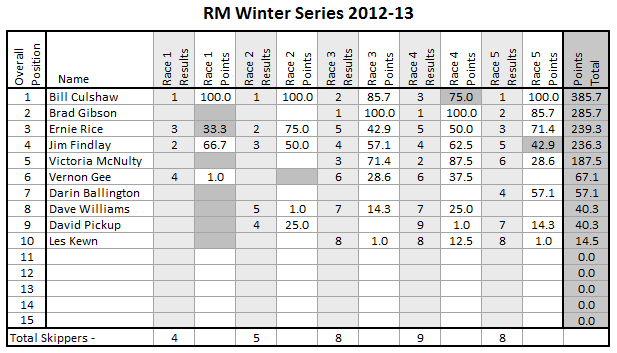 A reminder to all that this coming Saturday, 23/2/13, is the final round of the RM Winter Series. Start time 1pm. Sunday, 24/2/13, is the Northern District IOM Winter Series Open Race, with a start time of 10am sharp. Entry is £4 which includes a Hotpot lunch. Please make sure you enter with Brad if you wish to sail. The Club Calendar for 2013 is now posted above on this site. This is a reminder that from 2/3/13 club races days will start from 2pm sharp. This year we are hosting a National IOM 2 day Ranking Race over 22nd and 23rd June and will require skippers not planning on racing to assist in organising this event to properly reflect that of the countries number one league club. The racing is counted as 2 separate race days, so if you wish to sail only the one day and help on another, this is possible. Entries for this event will need to be made through the official MYA means by either online or yearbook. Look for online entry to open in early March on the MYA website. Anyone able to offer assistance, please contact Brad, or a member of the sailing committee. We are hosting a National RM Ranking Race on Sunday 4/8/13 and have grouped this with a Saturday RM club race to attract greater numbers of travelling skippers. We will promoting this within the MYA as two days of RM racing to show this as being the way forward for the class, both on a racing an social level that justifies the expense of travel. The Birkenhead club, on behalf of the Northern District will be hosting a Workshop/Tuning Day on 10/8/13. We anticipate having to limit places for this and will be prioritising available spaces to Northern District members initially. More details to follow when they come to hand, but if you’re in the North and want tips from the likes of Roberts, Elliott, Walsh and Gibson, put this date in your diary. Saturday saw the final round of the Birkenhead IOM Winter Series with the sun shining and a light to moderate southerly breeze from the clubhouse corner. Racing was close once again right through the fleet. Results below. After 5 rounds and 34 different skippers competing congratulations go to Graha Birkett who took this year’s series by 2 points by the consisten Dave Burke, with Graham Elliott third. Once again this year’s Winter Series has proven as competitive as ever, with skippers travelling from as far south as London andOxford, and as for north as Fleetwood and Keighley to compete against some of the best IOM skippers in the country. Congratulations to all those involved and a big thank you to PROs Jack Turner and Bernie McNulty.